07 Nov 2018 --- Children following a healthy, Mediterranean style diet rich in fish may experience reductions in their asthma symptoms, researchers at La Trobe University have found. The findings add to a growing body of evidence on how a healthy diet can be a potential therapy for childhood asthma. “We already know that a diet high in fat, sugar and salt can influence the development and progression of asthma in children and now we have evidence that it's also possible to manage asthma symptoms through healthy eating,” says lead researcher Maria Papamichael of La Trobe University. 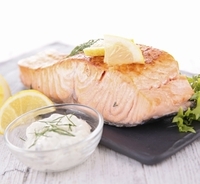 “Fatty fish is high in omega 3 fatty acids which have anti-inflammatory properties. Our study shows eating fish just twice a week can significantly decrease lung inflammation in children with asthma,” she adds. The findings are significant due to the high prevalence of asthma worldwide. Asthma is the most common respiratory disease in young people and one of the leading reasons for hospitalization and trips to emergency for children, notes Associated Professor Bircan Erbas. This necessitates the need for the identification of new therapies that can be used alongside conventional asthma medications. The trial involved 64 children from Athens, Greece, aged 5 to 12, who had mild asthma. Researchers from Australia and Greece divided the children into two groups and instructed around half to eat two meals of cooked fatty fish (of at least 150 grams) as part of the Greek Mediterranean diet every week for six months. The remaining children followed their normal diet. At the end of the trial, they found that the group who ate fish experienced a reduction of their bronchial inflammation by 14 units. Above 10 units is significant under international guidelines. The recommendation is to follow a healthy diet combining two fatty fish meals per week, as an adjunct to medical therapy for asthma, Papamichael tells NutritionInsight. The Mediterranean diet has long been known to score highly on the healthy scale. An Italian study identified that senior peoples, aged 65 years and older, who adhered closely to the Mediterranean diet have a 25 percent lower risk of any cause of death, while a separate study found that sticking to a diet rich in fruit, vegetables, nuts, unrefined cereals, olive oil and fish can reduce hip bone density loss within just 12 months.